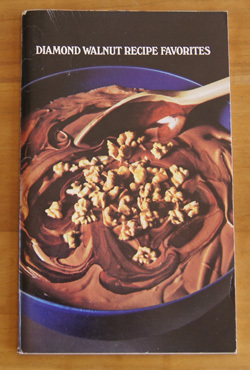 Cookbook #26: Diamond Walnut Recipe Favorites. Diamond Walnut Growers, Stockton, CA. No publication date given. There is no date in this booklet, but my guess is that it was printed sometime in the 80s or 90s. It was my mother’s. Since it was produced by the Diamond Walnut Growers (in California, where I grew up), I think it is mostly a gathering of recipes that had appeared on the packages of Diamond Walnuts over the years. My mother did not mark a single recipe in this book. I had a hard time finding a recipe to cook since most are high in calories (even the few entrees). I’m not going to keep this book, it will go to the recycle pile. Someone might appreciate it. The recipes are not bad, they just aren’t very different from the many cookie, cake, and bread recipes that I already have. I decided to make the “Walnut Lemon Muffins”. I will substitute vegetable oil for the melted shortening, add vanilla, and add a bit more lemon juice and rind. Also, I learned from Alton Brown’s Good Eats that sugar is to be treated as a liquid, so I added it to the wet instead of the dry ingredient mixture. Prepare 12 muffin cups, either by lining the cups with paper muffin cups, or by spraying a non-stick pan with non-stick cooking spray. Heat the oven to 400˚. Beat the egg lightly, then add the sugar and beat well. Mix in the milk, vanilla, 1 teaspoon lemon peel, lemon juice, and oil. Stir in the dry ingredients just until all of the dry ingredients are moistened, then add the walnuts. Do not over mix. Put into the prepared muffin cups. 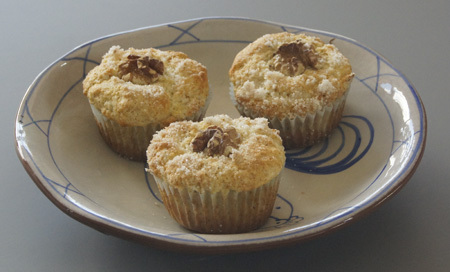 Sprinkle the muffins with the sugar-lemon peel mixture and then top each with a walnut half. Bake at 400˚ for about 20 minutes, until browned. These are very good! We had them (first) for Sunday breakfast. Even with my extra lemon, they aren’t very lemony-tasting, but the walnuts make them great. 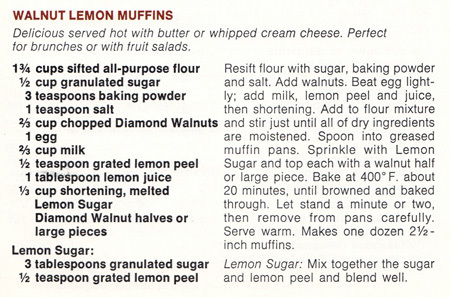 Don’t skip the lemon-sugar topping – it really brightens the flavor and appeal of these muffins. These reminded me of how much I like my own Lemon Poppyseed Muffins. It’s a recipe I tweaked until perfect, then added to my old 1990s Blog. It includes 1/4 cup of lemon juice, and they are definitely lemony-tasting. This entry was posted in 250 Cookbooks, Yeast breads by admin. Bookmark the permalink.